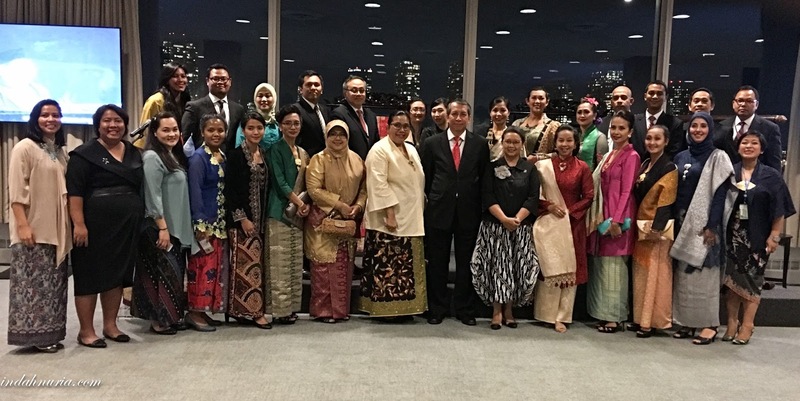 The harmonious melody from kolintang, one of Indonesian tradisional musical instruments, filled the UN Delegates Dining Room on the 4th floor of the UN Headquarters in New York. 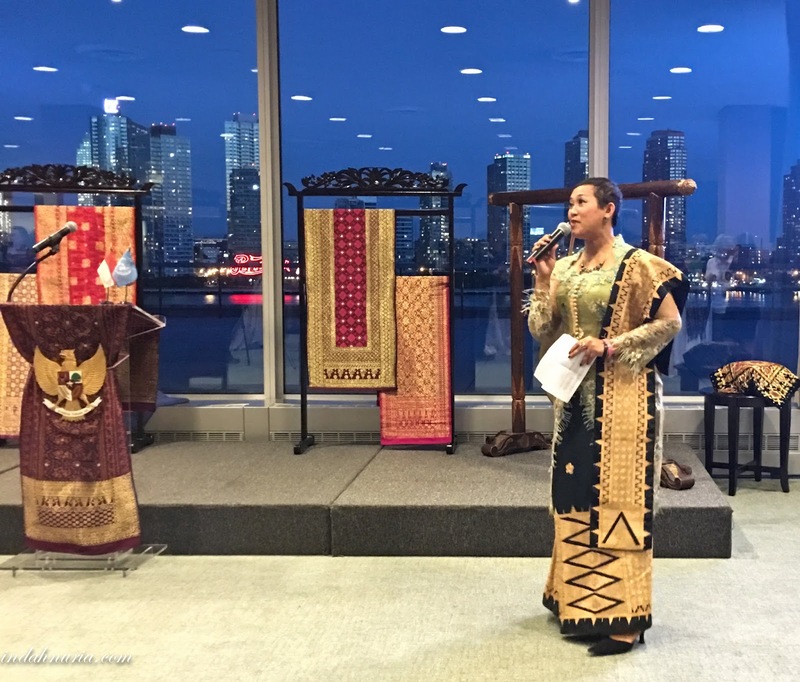 Angin Mamiri, one of the traditional songs from Sulawesi, welcomed and serenaded the guests that night. 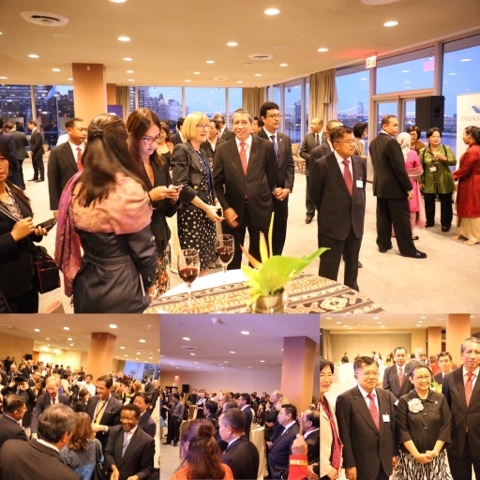 One by one, Prime Ministers, Foreign Ministers, Ambassadors, and other distinguished guests joined us that night for our national day reception. Yup, we had our annual reception for the 71st anniversary of the Indonesia's independence on the third week of September. 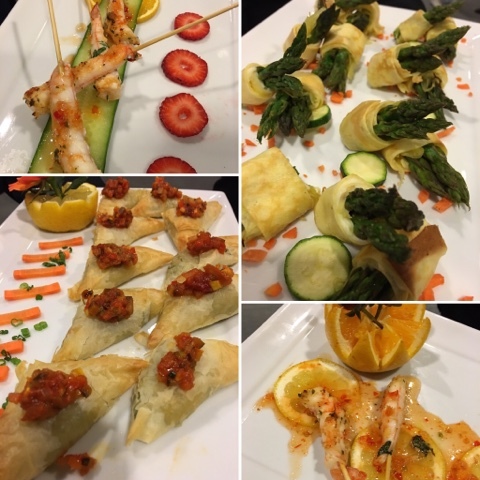 Hosted by H.E. Retno L.P. Marsudi, our Minister for Foreign Affairs, this annual event was convened on the margins of the High Level Week of UN General Assembly 71st Session. 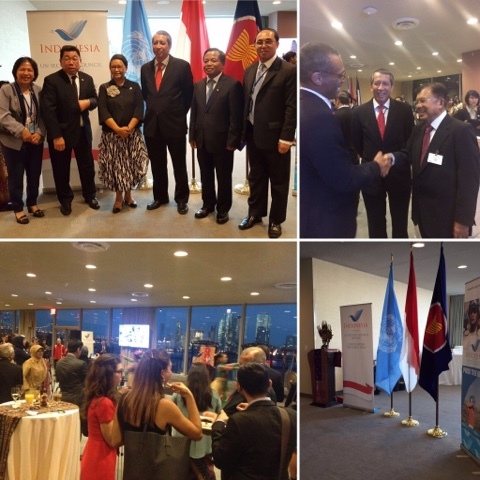 Although the independence day was celebrated on August 17, but here in New York City we held the reception during the September session on the UN GA in order to welcome more dignitaries and VVIPs. But this year is super special indeed. Because we have H.E. 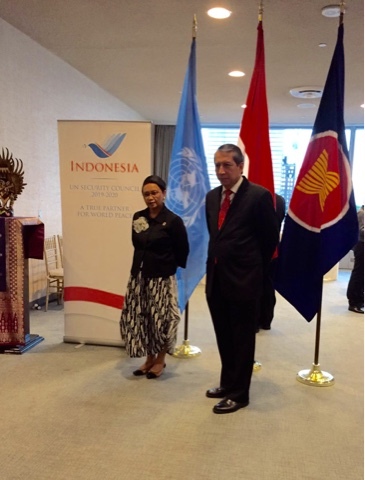 Jusuf Kalla, the Vice President of Indonesia and Madame Mufidah Kalla, his spouse, as our guests of honor. 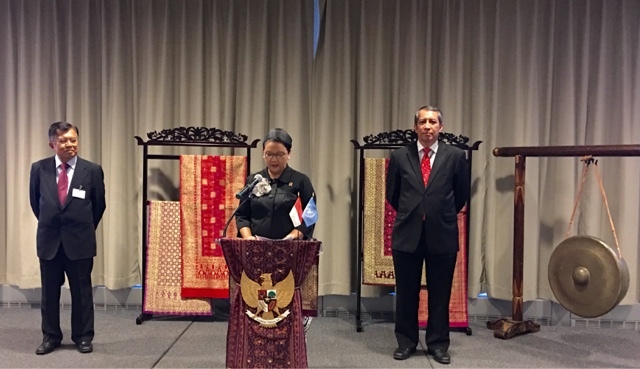 Moreover, we also have the official launch of the campaign for Indonesia's candidature for the Non-Permanent Member of the UN Security Council for 2019-2020. We also held the reception on the 4th floor of the UN Headquarters, slightly different from the usual venue of the meeting hall at our Permanent Mission. Hours before the reception, my colleagues and I were rushingly preparing the UN Delegates Dining Room. Tapis and songket were chosen as the main traditional fabrics we used for decoration that night. 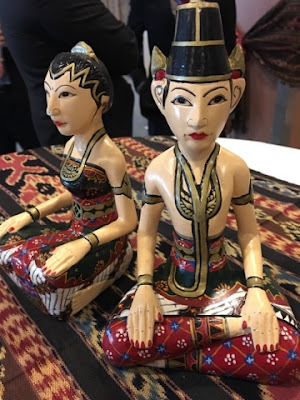 We mixed it with tenun Troso and loro blonyo, the famous Javanese couple in wooden form. 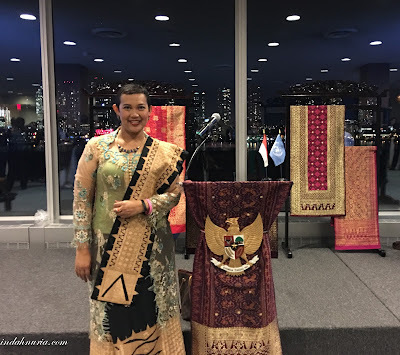 We adorned the room with more songket, tapis and tenun all over the place. 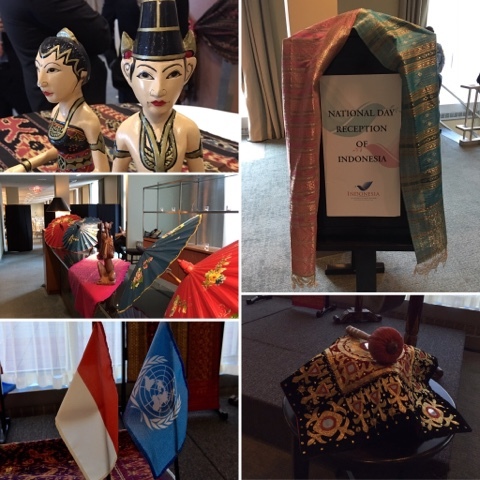 We were surely having fun decorating the room with Tapis and Songket at Indonesian Diplomatic Reception. Welcoming board, bar table, guest book corner, columns, souvenir bags corner. Colorful Sundanese paper umbrella also brighten up the room. 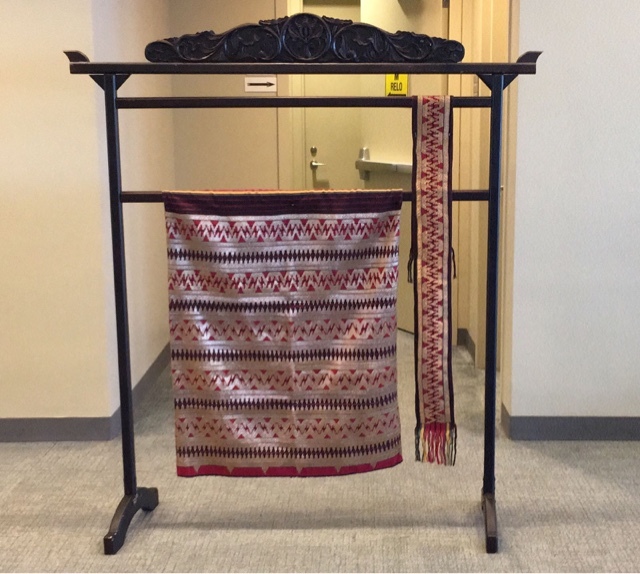 We used many gawangan, the tradional wooden fabric holder, to showcase those variety of songket, tapis and tenun being displayed. As for me, I was proudly wearing my Tapis Lampung in gold and black, coupled with france lace kebaya in turquoise and gold. Then around 6.30, guests were arriving. 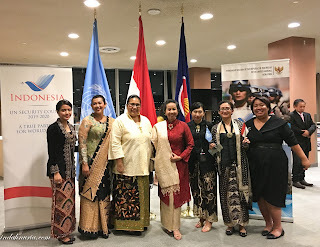 Minister Retno, adorned in black kebaya top and black-and-white batik skirt, welcomed our guests, while being accompanied by H.E. Dian Triansyah Djani, our Ambassador/Permanent Representative. 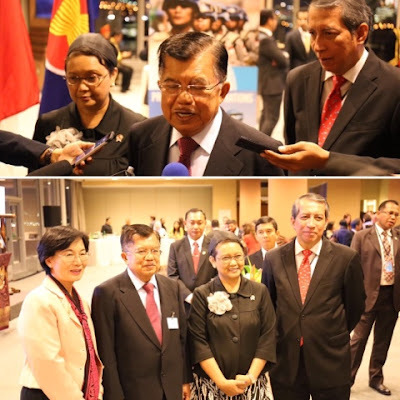 At 7.15, after the arrival of our Guests of Honor, H,E, Mr, Jusuf Kalla and his spouse, Minister Retno opened the reception with short remarks. 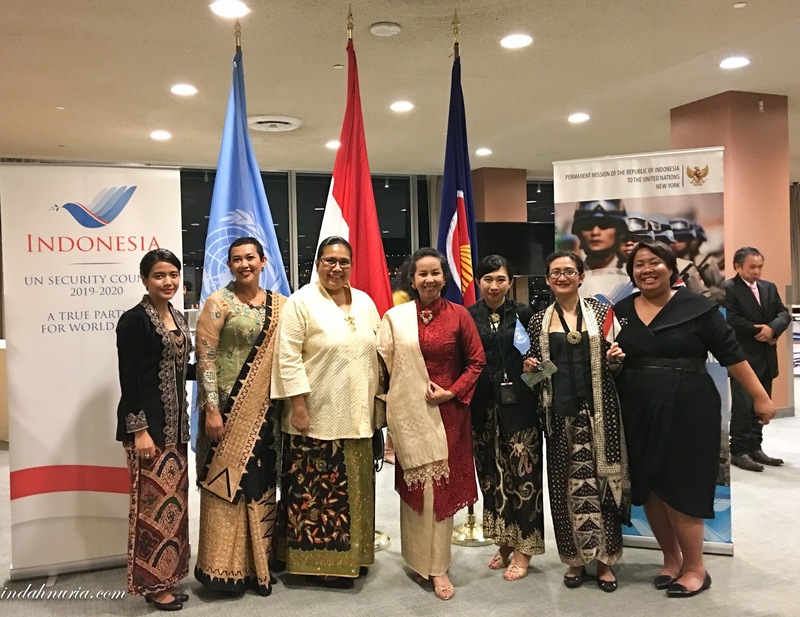 She officially launched the campaign for Indonesia's candidature for the UN Security Council Non-Permanent Member year 2019-2020 as well. Our Vice President stroke the gong as the symbol of that official launch. We sincerely hope we have all the supports from our fellow friends and states. good food and some traditional performances. Various choices of hot and cold hors d'oeuvre as well as Asian corner with sate, Mongolian beef and dumplings were served. For sure, we have some Indonesian traditional performances for our distinguished guests, gracefully performed by Saung Budaya, a special group preserving Indonesian traditional dances and cultural performances based in New York City. 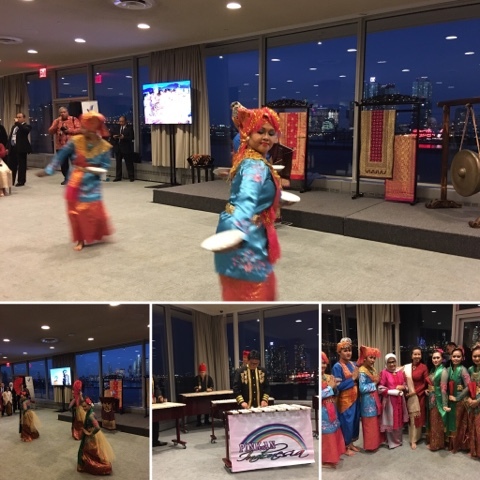 Tari Piring from West Sumatera and Tari Bajidor Kahot from West Java got a great applause from our guests that night. Then Pingkan Indonesia, a kolintang group from New Jersey, also performed some numbers of Indonesian songs and cotton field. I helped presenting those dances and kolintang performance as the MC that night :). Something that I haven't been doing for quite some times but always happy to do so. We closed the night with some photo sessions and wefie. 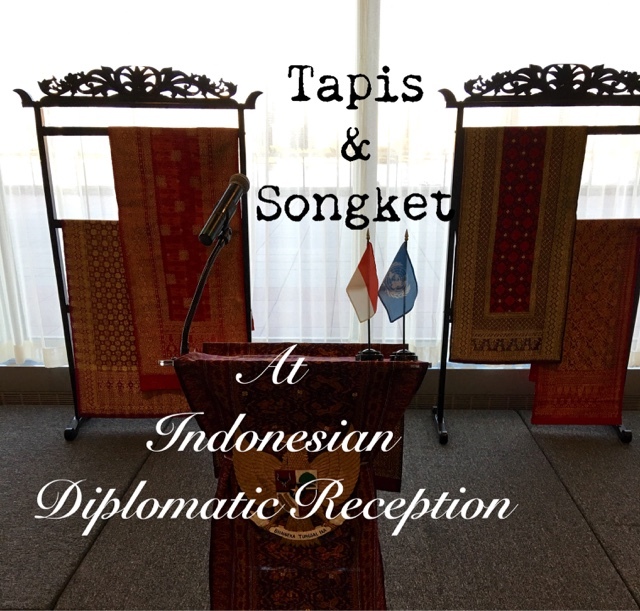 Have you been to a diplomatic reception before? thank you Dezi...yuup, I notice that.. It looks like quite an affair and I am sure that everybody enjoyed it. Congratulations on 71 years of independence, that is awesome. Aku blom pernah menghadiri resepsi diplomatik mbak. Btw you look so good in songket. 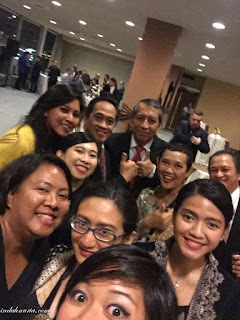 Kain2 Indonesia itu beragam banget ya Mbak. Cantik2 semua. bangeeet mba..and they love it! What an honor to be there. I bet it was a wonderful time. I love all the dress clothes. They are so pretty! Such cool patterns. Waw keren keren ya mbak andai saja ada ditempat saya insaallah saya akan mencobanya, gkgkgk. 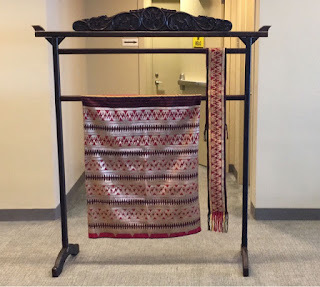 Kain songket itu manis kalo menurut saya, bikin yang make makin cantik. Waaah itu yang tapis dari Lampung cantik banget Mama Bo. Suka!